It wouldn’t make sense to do a guide for most clickers, since they tend to involve nothing more taking than tapping the screen and responding to prompts. Void Troopers is not most clickers. While it contains the core clicker gameplay loop of tapping to earn gold to buy things to help you earn more gold and so on, it has an ingenious time-traveling gimmick that you’ll need to negotiate if you don’t want your progress to grind to a halt. So read on to discover how to use your time wisely and reach the world 20 of Void Troopers as quickly as humanly possible. Void Troopers basically consists of two activities: earning gold, and spending gold. There are two other currencies — gems and Time Orbs, more on which later — but the vast majority of the game involves gold. It comes to you in a couple of different ways. Most is earned in battle or rather salvaged from the wreckage of your vanquished foes. After every wave of enemy ships, you’ll automatically collect coins. Pretty soon you’ll also be able to earn extra gold by sending Captains out on expeditions. These are on a timer, and over time you acquire more Captains to go hunting for loot. The higher the level, the longer they take to return, and the more gold they have with them when they do. Expeditions are found in in the fourth icon along the bottom row. It looks like a compass. When a Captain returns you’ll get a notification, at which point you can choose to either claim the gold and send them off on another expedition, or just claim the gold. The gold earned by these expeditions will keep scaling with your progress before you collect them too. It’s well worth holding on to completed expeditions until you need the gold for further down the road. The final way to obtain gold is to wait for the prize timer to finish, at which point you’ll receive a gift of either some gold or some gems. Which brings us nicely onto gems. Gems are the second form of currency, and they come to you much more gradually than gold. 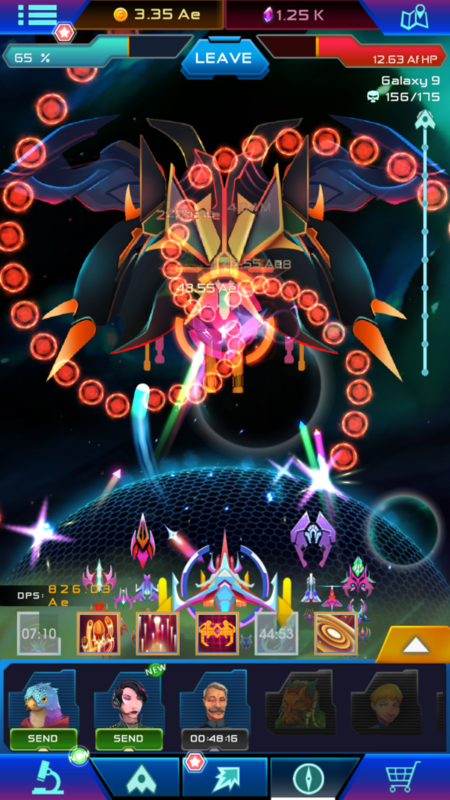 You get them by earning achievements (the icon in the top-left), defeating the daily boss (the Space Invaders logo on the left), and in your free gift parcels. Finally, you’ve got your Time Orbs, which come into your possession as you defeat bosses. Actually, let’s start with Time Orbs. The only way to spend the Time Orbs you’ve accrued is to travel back in time, resetting all of your progress and dumping you at the very beginning of the game with a single vessel and a puny weapon. To do this, visit the microscope icon at the bottom-left of the screen. In fact, there’s another way to spend them — by forking out 500 gems — but this guide assumes you prefer to play your free-to-play games for free. Once you’ve unlocked your Time Orbs by traveling back in time, you can spend them on a variety of permanent buffs, or Technologies. These do things like increase your Primary Cannon power, accelerate the speed at which you earn gold, weaken the shields of your enemies, and so on. The catch is that you can’t access all of these Technologies at the outset. You have to reach level 4 before time traveling to access the first set, and from there certain categories of tech only become available at certain levels. It’s difficult psychologically to give up the super-powered weapons and massive fleet you’ve spent hours building, but it’s a good idea to travel back and buff yourself whenever you can. It hurts at first but helps in the long run. Turning to gems, these are for spending on consumables like a limited time Autotap, a shipment of gold to boost your coffers, a death ray that you can only use once, and so on. We don’t see anybody rushing to buy these consumables since the cheapest one costs 50 gems. To put that into context, I’ve been playing for days on and off and I’ve still only got 366 gems. If you’re stuck, however, or you want to apply a buff without traveling back in time, you always have the option of forking out on an IAP gem bundle. The further you get in Void Troopers the more copiously the gold flows into your coffers, the more exponentially expensive everything becomes, and the more things there are to buy. Each ship in your fleet has its own unique strengths and weaknesses, plus an upgrade tree that tells you in minute detail what effect each gold coin you spend will have on its capability. There are also bonuses at certain milestones all the way up to level 500. 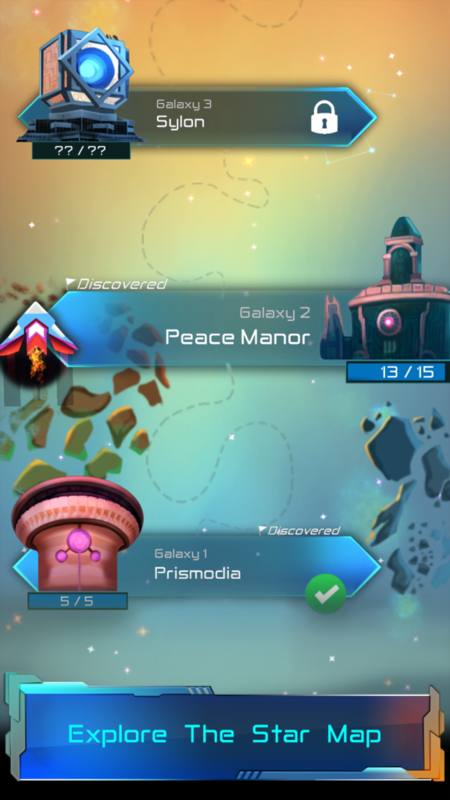 This is all very well, and you could in principle optimize your passage through Void Troopers by paying close attention to these upgrade trees, but most casual players will probably ignore them and spread the upgrades evenly. The beauty of a clicker is that this won’t prevent you from getting to the end. The biggest tactical consideration in Void Troopers, beyond whether to travel back in time or push on, is whether to emphasize active or passive play. That is, if you concentrate your gold on your fleet ships, you can get them to a point where you can put your phone down for a while and let them do the work. But this tactic won’t get you very far. 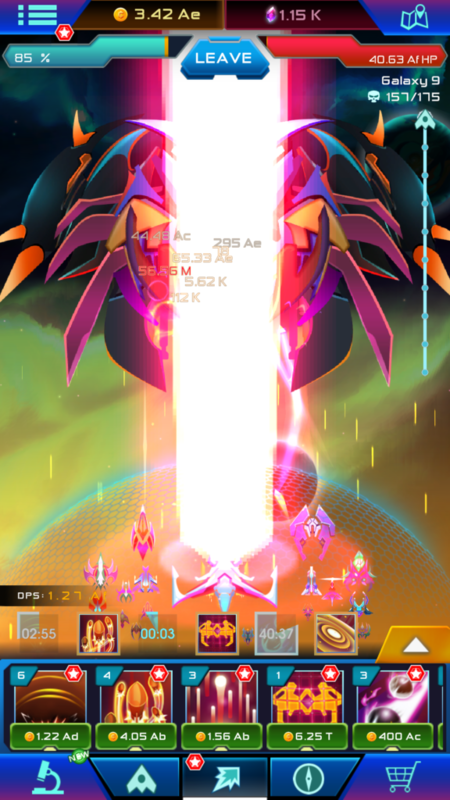 Your primary ship — the one that fires when you tap the screen — is far more powerful than any of the others, level for level, and the only way to get past most bosses is to step in and do it yourself. Plus, leveling up your primary ship levels up your whole fleet, so it’s worth keeping it in tiptop shape. The last way to spend gold is on special attacks (the asteroid-like icon at the bottom of the screen). These come into their own as you start to reach the more difficult bosses. Special attacks are rechargeable rather than consumable, so if you hit a boss you can’t beat you can generally crush them with an all-out special attack assault, after which you can just turn the game off and wait for your coffers to fill and your special attacks to recharge. Some would call this lazy, but we say it’s just efficient. 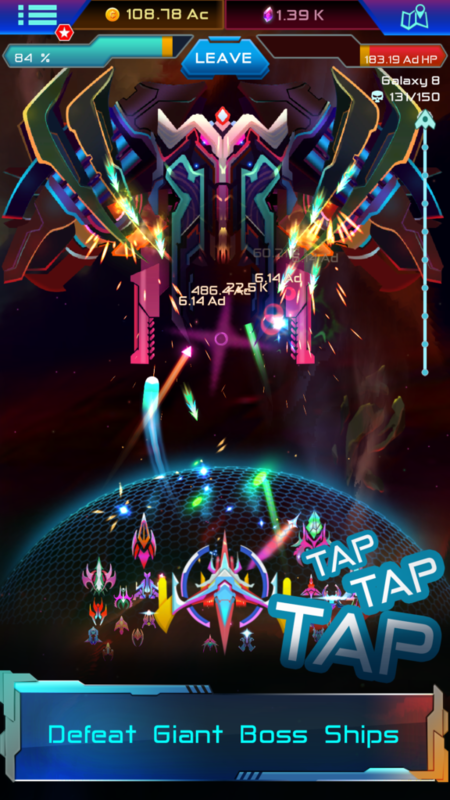 You can download Void Troopers on the App Store and Google Play now.